Melted chocolate integrating with cream to create this savory custard-like chocolate pudding. Top it with a dollop of homemade whipped cream and a sprinkle of chocolate bar pieces. 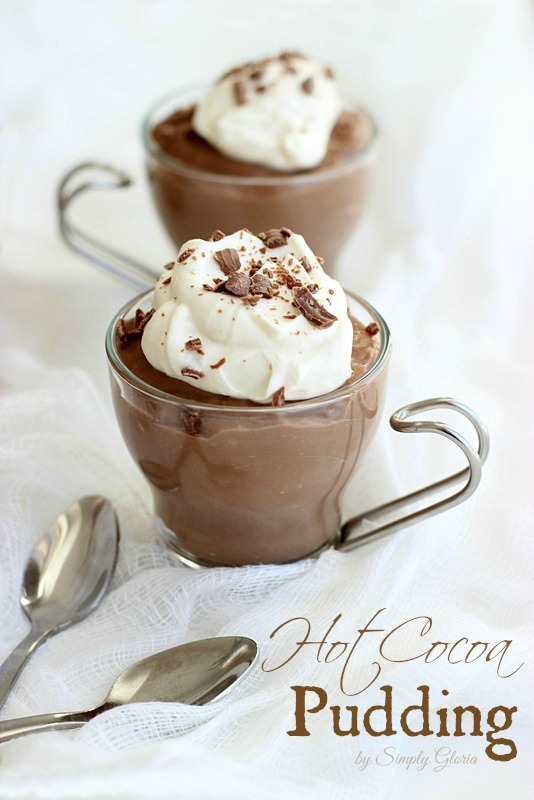 Hot Cocoa Pudding is delightfully eaten heated or cooled! All I can say is that I am SO ready for it to be summer time here in Utah. Which pretty much means, it won’t be 100 degrees (my desired temperature) until July! We live in a higher elevation, which means our summers are shorter and our winters are sooooo long! Since we are all trying to get through this recent extremeness of brrr chilly temperatures… thought I’d throw in a little sweet treat I make all the time for my boys. Hot Cocoa Pudding topped with whipped cream AND shavings of candy bar pieces on the top! Hot cocoa AND chocolate pudding are two of our most favorite chocolaty fast treats I make in our home. So, I thought I would just combine both of them together! If you’ve never attempted making pudding from scratch before, it is really much more simpler than you would ever expect. You may not ever get to those pudding packages you have stored in the back of your cupboard after you make this kind of pudding. Unless you make cookies with that pudding package! This is a no-fail kind of recipe. I promise. Melted chocolate integrating with cream to create this savory custard-like chocolate pudding. Top it with a dollop of homemade whipped cream and a sprinkle of chocolate pieces. 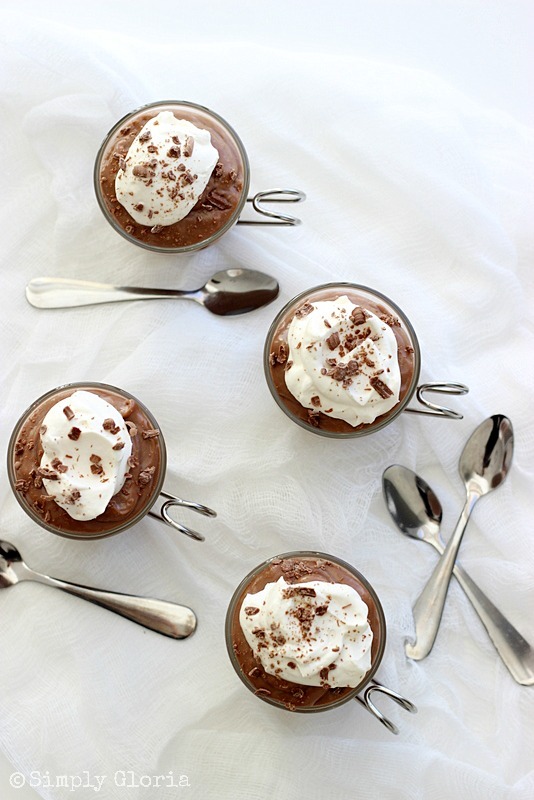 Hot Cocoa Pudding is delightfully eaten heated or cooled! Makes about 3 cups of pudding. 1 (4.25 ounces) large chocolate candy bar, I used Hershey's Symphony Creamy Milk Chocolate Bar. Save a square of the bar to garnish on top of the whipped cream. Use a vegetable peeler or a grater to shave the chocolate. In a heavy large sauce pan, whisk together the sugar, cornstarch, hot cocoa mix, and salt. Immediately add and whisk the milk and yolks (while burner is heating up). Continue to keep whisking while the liquid is heating up for 10 to 15 minutes. Once it starts to thicken and bubble, turn off burner and take the pan off the heat. Add the vanilla, pieces of candy bar, and cold butter pieces– while you are still stirring with your whisk. Once the butter and chocolate has melted, put into a bowl and cover with plastic wrap on the surface of the pudding to prevent a skin forming. Make sure the wrap is touching the pudding on the top. Refrigerator until cooled (about 2-4 hours) or over night. Mix with a hand mixer the heavy cream, vanilla, and powder sugar on low speed. Once everything is combined and starting to thicken, turn up the speed until you have peaks in the cream. Put a dollop on top of the pudding and garnish with shaved chocolate bar pieces. Enjoy, my friends… and stay warm! Want to stay updated with my latest creation? Simply subscribe or Follow my blog with Bloglovin and every time I post something new…you’ll conveniently get it straight into your inbox! What a fun looking dessert and I love anything chocolate! Pinning! You’re so sweet, Deb… Thank you! This looks ssssoooo good – and those cups are fabulous! So cute! Can’t wait to try this. Pinned! Well, it’s going to be still very snowy when you get over here next month! It’s a full on blizzard right now… and already got over a foot up here at the resorts… just within the last couple hours! You’ll be in love! Ohmahgosh, girl! I just LOVE this! 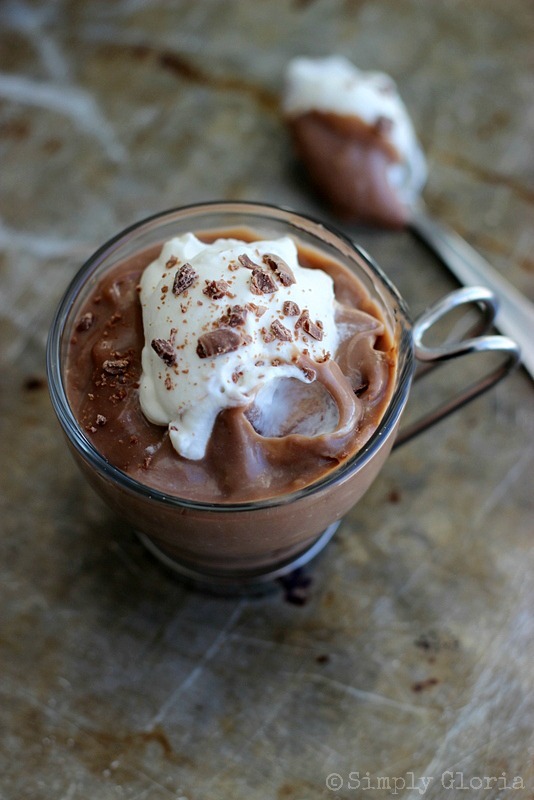 Homemade pudding is always better than packaged mixes and your hot cocoa twist is so sweet. Love your styling and photography here. Read your About page and dig how you roll. (I’m crazy about my husband, too. And, appreciate when he does the dishes so I “can have a clean lab” as he says, LOL. Our guys are keepers!) I can’t wait to see what other tasty delights you come up with in 2014. Wishing you and your family all the best in the New Year! Pinning (of course)! Gloria, there is just something about pudding that makes me happy – it’s definitely sweet comfort food and think takes us all back a little bit to when were young! This looks and sounds so awesome! Thanks for sharing – pinning and buffered! Hope you have a warm, happy and fun Thursday! Isn’t that funny how pudding reminds us of when we were younger?! Crazy. Because that’s exactly what I think whenever I have some! Thanks, Cindy. Stay warm over your way, as well! 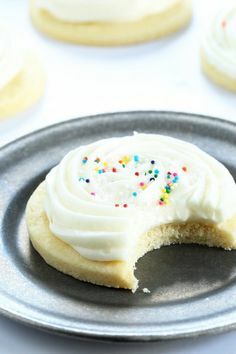 Gloria, this looks so creamy and amazing! I’m pinning this — gotta try it! We love pudding at our house and this looks delicious! Yum! Oh my! This looks fantastic Gloria! Italian hot chocolate is so thick you would think it is pudding. This reminds me so much of that! Glor-i-a-!! Girl! These look so dang incredible! Perfectly decadent and those pictures – ohmygosh! Gorgeous!! Pinned, of course 🙂 And, I’m sharing on Facebook tomorrow! We had a little heat wave today before the storm tonight. But, hope you are having a fun Saturday with your little family, Kelly! Great description, Rakesh and Swikruti! Julie, I’ll work on the snow part… I have lots to share from here! This pudding looks unbelievably fudgy and decadent, Gloria! Even though it’s only 11am, I kinda want a big bowlful of this pudding in front of me right now! Sarah, that’s around the time I made this the other day… and it’s sooo good right before lunch. But of course, I could eat any sweets for any meal! Have a great weekend! Always love your from scratch recipes! And p.s. looking at this is killing me right now while Mike and I are on this Paleo Fast. If I could eat the screen, I WOULD! This looks awesome and a perfect fun dessert for the cold temperatures lately! Pinning! Krista, you always make me laugh! Good luck with all the temptations online! Oh, how I could just dive right into one of these right now! So much chocolaty goodness! Thank you, Ashley! Hope you’re having a great weekend! There’s something about the simplicity in chocolate pudding that I love. You make this look so good. Yum! You are so sweet, Melanie. Thank you! Having warm pudding on cold nights are sooo my favorite thing, too! Thanks, Erin! Ashlyn, thank you! Hope you’re enjoying your Saturday night! Do I even need to tell you how amazing this looks, Gloria? YUM! You always make me smile, Andi! You are so sweet, Min… thank you! Oh, I LOVE warm pudding! And this one looks wonderful! Oh goodness! It’s late night on Sunday and right now I’m thinking about running into the kitchen and making this! Gloria this pudding is calling my name, it looks divine! Super yum!!! This pudding looks fantastic! 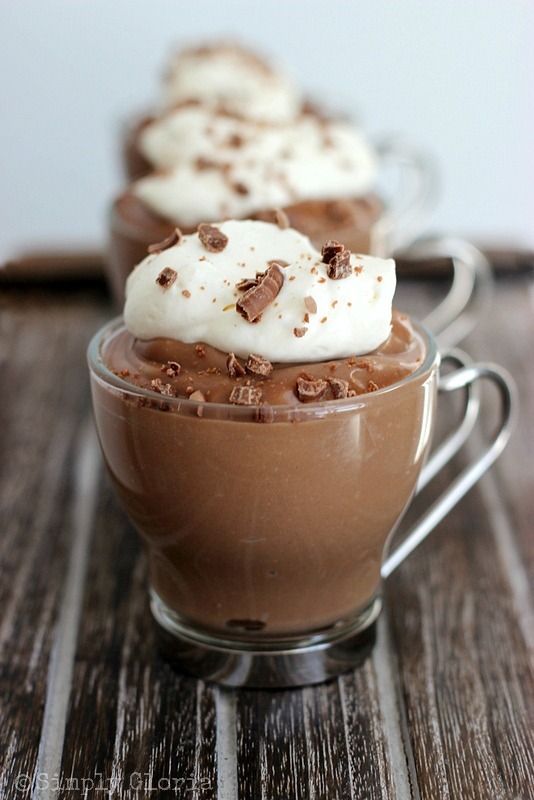 Hot chocolate anything is great, but warm hot chocolate pudding sounds like Heaven!